The universe seems to be the last station in a ‘universal’ communication. Its existence and nature have been an object for long debates throughout the ages. Often, it was associated with spiritual elements and/or projections of fear. Anything from outside the direct realm of the earth was unknown and could be dangerous. The cosmic history of the earth is a human story of wavering views and confusion. The universe as the ultimate consciousness comprises the last boundaries of our imagination. Copernicus’ revolutionary proposal (in his book ‘De revolutionibus orbium coelestium‘ (On the Revolutions of the Celestial Spheres), published just before his death in 1543 and stating that the earth was not the centre of the universe) was not the outcome of wider division thinking, but just the opposite. It was the rigid application of a process of natural observation in a dualistic framework, which led to the possibility of inversion: not the earth in the centre but the sun. 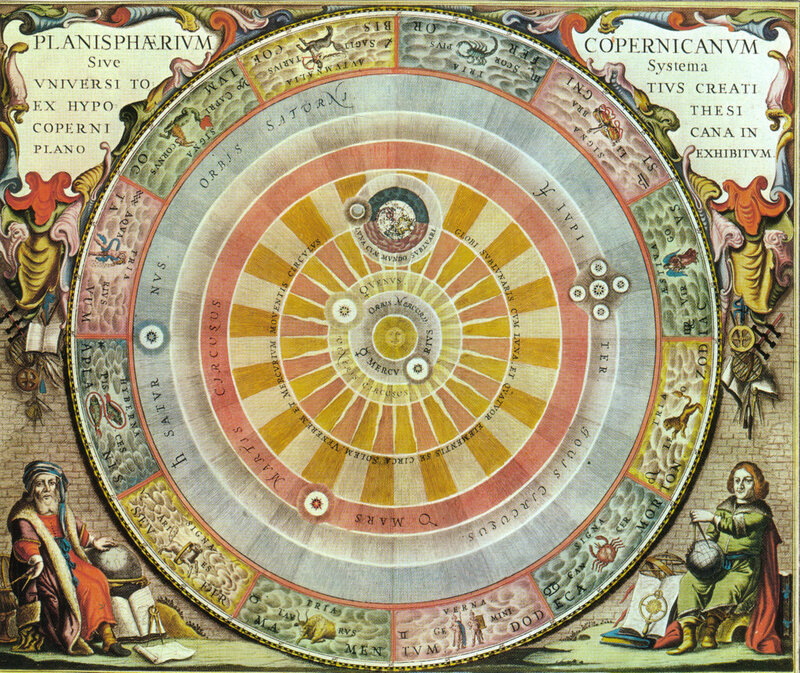 The world view changed in the sixteenth and seventeenth century after Copernicus placed the sun in the center, overruling Ptolemaeus who had seen the earth as a center point. The observations with a telescope provided new information, like the four moons of Jupiter. KENTON, Warren (1974). Astrology. The Celestial Mirror. (Art and Cosmos. Jill PURCE (Ed.). Avon Books, New York/Thames and Hudson Ltd., London. LCCC 73-89279. The Italian monk Giordano Bruno (1548 – 1600), who was encountered earlier (p. 72) as the man who looked at the First Quadrant from a Third Quadrant-viewpoint, envisaged the sun as just another star in an infinite space. His speculations were, basically, also the result of consequent op-positional thinking. Either the sun is a unique point of light, and the stars were some other minor light spots (the accepted opinion) or the sun was just a spot among others, only much clearer (Bruno’s proposition). The suggestion that his astronomical ideas led to the condemnation by the Church and a subsequent burning at the stake might be false. His melodramatic last words (‘Today you burn me, but in the future all men will believe as I believe’) only added to the rhetoric. There are serious reasons, as noted by POGGE (1999) and BLACKWELL (2006), to believe that the Church’s complaints were more theological than astronomical. They had to do with the retaining of power, both spiritual as worldly. The official condemnation of Copernicanism by the Church – in the ‘Sacred Congregation of the Index’ – took place some sixteen years after Bruno’s death (1616). Unfortunately, all the relevant records of Bruno’s conviction and trial in 1600 were lost, so any judgement must be a conjecture. It seems more likely that his rigid way of thinking, based on polarity and inversion, was the real reason for concern by the Church. Any belief, which is put under pressure of oppositional thinking, will be faced with extremism (or in a more modern variety called fundamentalism). No man in power – be it religious or profane – is happy with developments, which will, sooner or later, question the centre of power itself (as happened in the Catholic Church in the early sixteenth century and in many later revolutionary political movements). Deep down, the Church might have felt this threat. Isaac Newton, born in 1642, developed a comprehensive theory of gravity, which can be regarded as a universal communication model based on two-fold thinking. It will come to no surprise, that one of his first theoretical successes (in 1665) was the (re) discovery of the binomial theorem. A binomial is an algebraic expression with two terms. Newton’s intellectual journey started with the mathematical adventures of the multiplication of two terms. The general terms (a + b) can be raised to a power (1, 2, 3 or more). This action is called a binomial expansion. The equation (a+b)² = a² + 2ab + b² is just an example in which n = 2 and the number of terms (on the right hand side of the equation) is 3. The expanded form consists of the terms a and b to the power n and some intermediate terms. The total number of terms in the expanded form of (a+b) to the power n is always n + 1. For instance, (a + b) to the power 5 gives n = 5, and the number of terms is 6. If the various values of n (1,2,3, etc.) are written down, then the coefficients will follow an array called ‘Pascal’s triangle’ (see below). Note that every number in the interior of the triangle is the sum of the two numbers directly above it (except at the top). This type of computing (or the construction of the Pascal triangle) was already known to the Baghdad-based mathematician al-Karaji (953 – about 1029). He wrote a treatise on algebra called ‘Al-Fakhri’. The formation of the triangle was also recorded in a description of al-Karaji’s work by the Muslim mathematician al-Samawal (or Samau’al Al-Maghribi, 1130 – c. 1180). 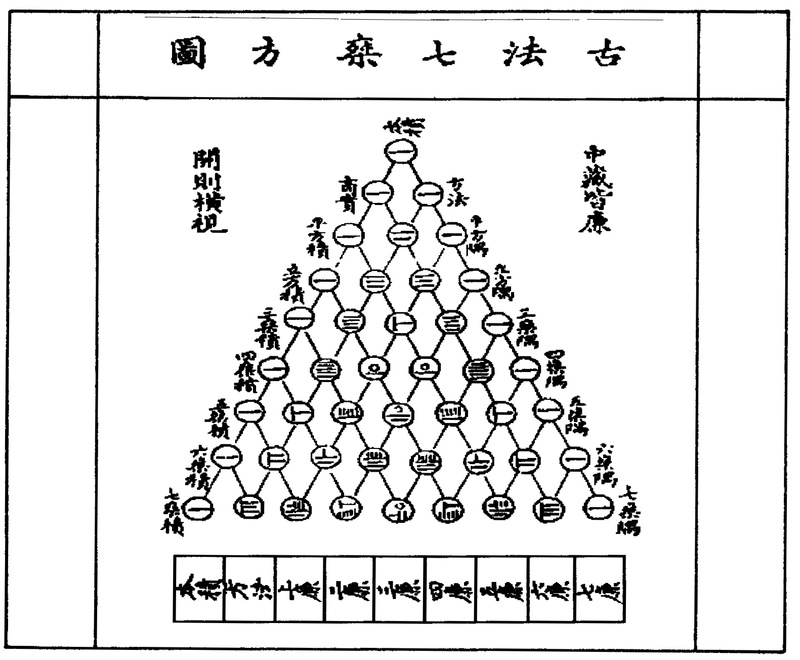 Pascal’s triangle was likewise known in China some three hundred years before Blaise Pascal (1623 – 1662). The great Chinese mathematician Zhu Shijiei (1270 – 1330), living in the Yuan Dynasty, gave an example of the triangle to a depth of 8 (fig. 86). Fig. 86 – The ‘Zhu Shijiei triangle’ to a depth 8. The ‘triangle of Pascal’, as it later became known, is not only an algebraic curiosity, but it also points to an intellectual desire to reach into the depth of dual thinking. Persian-Iraqi mathematicians like al-Karaji (Karaj being a city in Iran; the other rendering of his name as al-Karkhi points to a suburb of Baghdad) and Omar Khayyam felt attracted to the unequivocal possibilities of oppositional thinking. The germinal inspiration of a long established Zoroastrian dualism cannot be excluded by these twelve-century scientists. Let us now return to Isaac Newton and his gravitational communication model. His study at Trinity College in Cambridge was temporary suspended due to a severe outbreak of the plague, and he returned to his birthplace Woolsthorpe Manor in Lincolnshire (England). This year at home (1666) became his Annus Mirabilis, a marvelous year. The simultaneous achievements in the fields of gravity, optics and mechanics were the results of a fruitful application of mathematics to the various fields of nature. A strict adherence to dualistic principles is the premise of his thoughts. Newton’s proposition that every particle of matter attracts every other particle in a certain way was captured in the inverse square law. It stated that the force of gravitational attraction between two bodies decreases with increasing distance between them as the inverse of the square of that distance, so if the distance is doubled, the force is down by a factor of four. The vision of a universal communication between particles (of matter) had by the middle of the seventeenth century become a measurable correlation. It opened the way for a gratifying field of investigation. All imaginable material substances in the universe were now intrinsic connected with each other, and their distances were captured in a deterministic law. This state of affairs remained more or less unshaken until Albert Einstein (1879 – 1955) questioned the peculiar setting of participants in the (universal) communication in the first quarter of the twentieth century. He challenged the flat, Euclidean space and the uniform, absolute time of everyday experience. The idea was presented that attraction and repulsion (intensio and remissio) in a communication were no longer measured only from a deterministic point, but also from an agent moving at different speeds (up to the speed of light). The intellectual exercise posed a mind-provoking challenge, shaking the foundation of physics. The concept of relativity in the gravitational field sparked a new conscious about movement, distance, time and the importance of a position. Different gravitational laws had to be applied in the order to capture this setting. The observer was no longer the noble and stable watcher of nature, but became an uncertain, subjective spectator endowed – at best – with common sense. Science got a shudder since the laws of physics were supposed to be independent of any particular reference frame. The established Newtonian laws needed a revision in order to make them ‘universal’. Any theory of the origin of the universe had to take this relativistic advance into account. The primordial universe is situated in the invisible invisibility (of the First Quadrant). A reaction (attraction) takes place in an invisible gas-like state, resulting in a visible form of material presence (condensation). The philosopher Immanuel Kant (1724 – 1804) introduced already the idea that the Sun and planets could have formed by condensing out of a great rotating disk of gas and dust. Nowadays, it is known that (Kant’s) gaseous disks are frequently found around most young stars forming in the Milky Way. The most popular theory at the moment looks at the birth of the universe as a single event: the Big Bang. The model is highly theoretical and finds its real origin in mathematical calculations focused on a singularity. The initial, first division is thought to have taken place as a creatio ex nihilo, in the invisible visibility (of the Second Quadrant). This theory perceived one large explosion in which – in a very short period of time (the fireball phase) – matter is formed. This scattered material is later – under the influence of forces of attraction and repulsion – ordered in cosmic configurations like galaxy and planets. De Sitter (1917) produced the first non-static model as an alternative of the static model of Einstein. The latter introduced a cosmical constant in order to keep the relativistic forces of the universe at bay. In the meantime, the brilliant Russian mathematician Alexander Friedmann (1888 – 1925) spent his time as a volunteer on airships, bombing the Austrian troops and became involved in the Revolution of October 1917, but also found the time to discover the expanding matter-filled world model in 1922. He stated, in his article ‘On the curvature of Space’ in the ‘Zeitschrift für Physik’, that the radius of curvature of the universe can be either an increasing or a periodic function in time. Georges Lemaitre (1894 – 1966) was one of the pioneers of a dynamic universe (BERGER, 1984). He stated (in 1927) that the universe was unstable and that the perturbation tended to grow. ‘The evolution of the universe can be compared to a display of fireworks that has just ended: some few wisps, ashes and smoke. Standing on a well-chilled cinder, we see the slow fading of the suns, and we try to recall the vanished brilliance of the origin of the worlds’ (Georges Lemaître (1931). Rev. des Quest. Sci., Nov. p. 391). This theory on the origin of the universe was put forward around 1920 by the English mathematician and physicist James Jeans (1887 – 1946) and revised in 1948 by Hermann Bondi and Thomas Gold. In the sixties, Fred Hoyle became a keen advocate of this theory in its competition with the alternative Big Bang theory. The Steady State theory suggests a situation of equilibrium, in which the universe has no beginning or end and maintains a constant average density. Material is continuously created to form new stars and galaxies and also discarded at other places (or becoming unobservable as a consequence of their increasing distance and velocity of recession). The discovery of cosmic background radiation by Arno Penzias and Robert Wilson (in 1963), awarded with the Nobel Prize in 1978, put a strong case for the ‘Big Bang model’ and virtually put the ‘Steady State theory’ to rest. Some technical alterations (by HOYLE et al, 1993 and NARLIKAR, 1999) resulted in a revised quasi-steady state cosmology (QSSC). An inventive steady-state theory was put forward by the writer Brian LUMLEY (1999), who concocted a convincing case in his approach to the history of the universe. The theoretical boundary of the universe, he said, is the speed of light. He believed that the so-called ‘black holes’ (where gravity is so great that even light cannot escape) are the traces left behind after a body has reached the speed of light, past it and ‘left’ our universe. At that very moment, time is frozen and the vortex left by the departure lasts indefinitely. Any object passing beyond the boundary (of the speed of light) will end up in the Big Bang itself. In fact, is the Big Bang. The apparent lack of weight of the universe can be explained by the existence of a surplus in gravity in the fast-fleeing galactic bodies on the rim of the universe approaching the speed of light. The result of all those bodies breaking through the space-time boundary of our universe and finding themselves back in the Big Bang would be, indeed, a ‘steady state’. Lumley’s conclusion – ‘The universe is self-perpetuating, and the Big Bang is happening now and always will be but on the other side of the space continuum’ – is certainly a valuable contribution to the history of the universe. Finally, there is the theoretical possibility of a cyclic expansion and contraction by the forming of matter. The Austrian mathematician Ludwig Boltzmann (1844 – 1906), known as the inventor of statistical mechanics, suggested that the order in the universe might be just a very rare occasion with a temporal character. It is possible that after an enormous duration, another ordered universe would appear. And the line of ordered universes might get so long, that – after a very, very long time – the same universe (like ours) turns up again. This theoretical (statistical) approach fits into a quadralectic outlook, in which order (measurability) and chaos (immeasurability) are seen as stages in a shift between four- divisions (and depend on a coincidence of boundaries; see p. 96). The cyclic view does not give a practical solution for the moment of creation, but it points to a certain period of visibility. A theoretical beginning of a cycle (on the circle) can subsequently be calculated from the given, empirical entity. The Big Bang-theory, which is most fashionable at the moment and will be followed here, provides a reference to the quadralectic discussion. The creative act of a ‘Great Explosion’ offers a solution to the problem of the ‘first division’ in the realm of division thinking. The origin of matter is placed in its first theoretical visibility and represented as a mathematical singularity. There is no objection to this procedure, as long as the nature of the division environment is clearly stated. The beginning (and continuation) of a communication in a dualistic universe is quite different from the same event in a quadralectic setting. The First Beginning (or Big Bang) – as an act of creation – is thought to have taken place some 15 billion (15.000.000.000) years ago. This ‘date’ was calculated from a distance, i.e. the furthest cosmic communication partners known at the time. Edwin P. Hubble discovered in 1929 that the velocity of a galaxy’s recession is proportional to its distance. He calculated an expansion rate (the Hubble constant) of 500 km/s/Mpc. This initial estimate turned out far too high. A number of scientists met at the Aspen Center for Physics in 1985 to find the ‘HST Key Project on the Extragalactic Distance Scale’. They could bring the error in the expansion rate of the Universe and the Cosmic Distance Scale back to 10%. At present, a rate between 50 – 100 kilometers per second per megaparsecs (one megaparsec = light travels in 3.26 million years) is generally used. The lower values pointed to a universe, which was far older and larger than suggested by the earliest measurements by Georges Lemaitre and Jan Oort. The determination of the Hubble constant (Hº) required the measurements of velocity and distance. The measuring of a galaxy’s velocity was straight-forward, because of its light dispersing in a spectrum. The spectral lines shift to a longer wavelength by amounts proportional to the velocity (the earlier mentioned red-shift). However, problems do occur. Firstly, because the galaxies interact gravitationally with their neighbors and secondly because an accurate distance scale is difficult to establish. The distance to galaxies is measured by a Cepheid variable. These stars change in brightness in a periodic and distinctive way. The distance to a Cepheid can be calculated from its period (the length of its cycle) and its average apparent brightness (its luminosity as observed from earth). A Cepheid’s brightness is proportional to its surface area. Large bright Cepheids pulsate over a long period just as large bells resonate at a low frequency (or longer period). The period and the average luminosity give an absolute luminosity (that is the apparent brightness if it were a standard of 10 parsecs away). It was mainly due to the painstaking work of Henrietta Leavitt (1868 – 1921) – as referred to earlier in this book (p. 162, fig. 60) – that this relation became a ‘yardstick to the universe’. The problem of the Cepheid method was the occurrence of dust between the stars (diminishing the apparent luminosity) and the presence of chemical elements, which differ in brightness. Hubble’s constant is now given at 70 km/s/Mpc or somewhat less in the middle 60 range. This value gives an age estimate for the universe of 9 – 12 billion years. A higher (Hubble) constant of, for instance, 100 km/s/Mpc would result in a universe of about 6.5 – 8.5 billion years old. A lower (Hubble) constant of say 50 km/s/Mpc gives a universe with an estimated age of 13 – 16.5 billion years. Wendy L. FREEDMAN (1992) and her team proposed, in an article on ‘The Expansion Rate and Size of the Universe’ (Scientific American – Nov. 1992), a high expansion rate and therefore a relative young universe of perhaps 10 billion years. A similarity with the origin of Man comes to mind: when does the actual communication cycle start? The answer lies, in the case of Man (Homo sapiens), in the discovery of a skull or skeleton as a physical proof. The very origin of the universe will never be found in that way, but will remain a theoretical matter, without a final scientific proof. It is possible, despite the innate uncertainties of the Hubble constant, to construct the communication cycle of the Universe in a comparison with the Solar System (as our largest frame of reference from an earthly point of view). One only has to make a choice of two age-determinations. Different options (of starting dates) remain open, and they can be compared (after-wards) in their own right and judged accordingly. The same procedure was followed by the appearance of Homo Sapiens on earth (see fig. 78/79/80) and the presence of the earth as determined by the LVA’s (Large Visible Animals), and will be followed here again. The assumptions are that the initial creative event of the ‘Big Bang’ took place 15 billion years ago and the first visibility (FV) of ‘our’ solar system is dated at 5 billion years ago. Fig. 87 gives the CF-graph for the universe as related to the solar system (of which the earth is a part). Fig. 87 – This communication graph (CF) gives the relation between the Universe and the presence of the earthly solar system. The ‘Big Bang’-event, at the beginning of the communication cycle, is placed some 15 billion years ago (based on calculations of the furthest removed objects in the universe). The first visibility (FV) of the (earthly) solar system is put at 5 billion years ago. 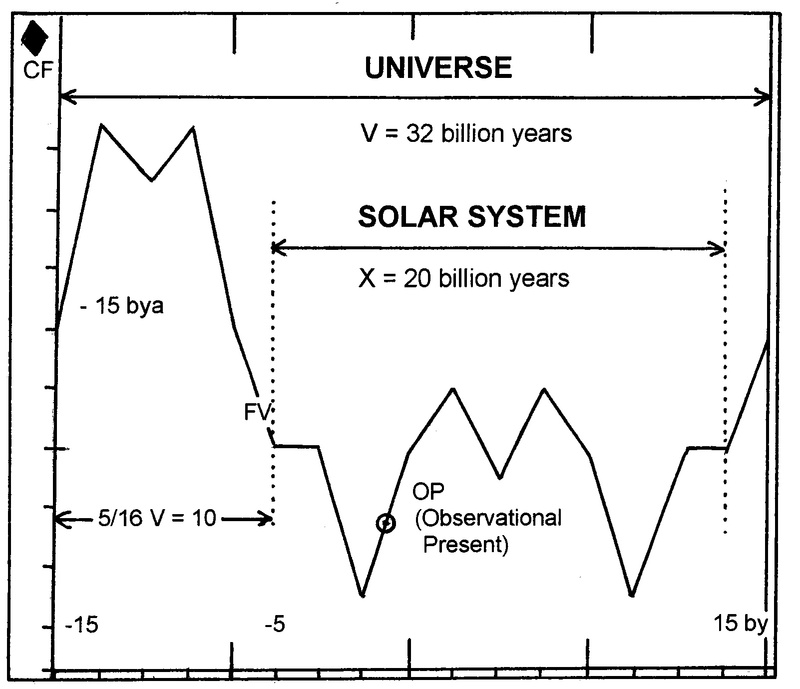 The universe has a total life cycle (V) of 32 billion (32000 million) years. The visibility of the solar system is established from -5 billion (in the past) to 15 billion years (in the future). 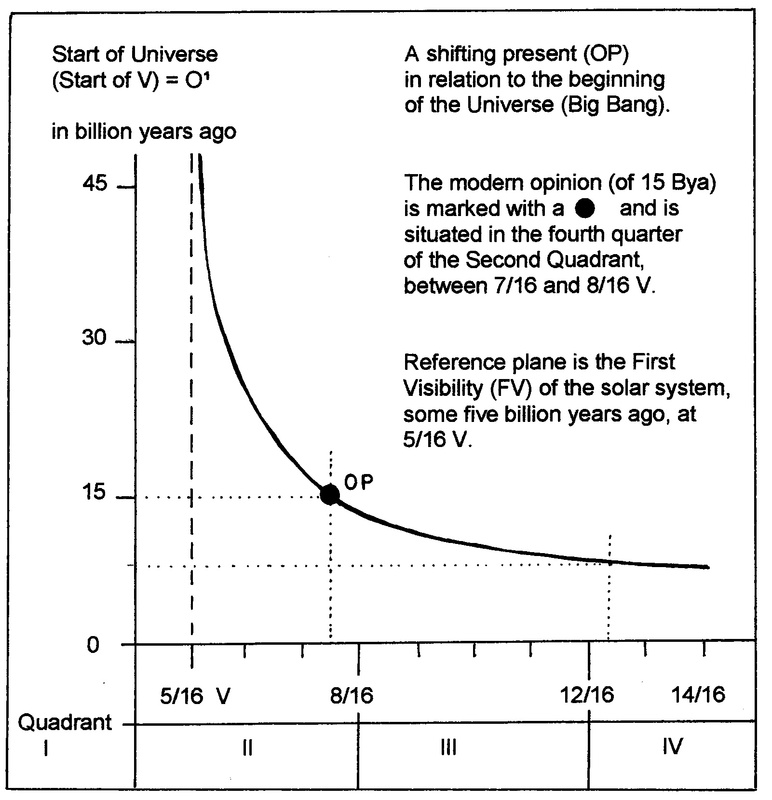 The (observational) present (OP; 15 billion years from the theoretical beginning of the universe) is situated in the fourth quarter of the Second Quadrant (II, 4; with a CF-value of 8.5). Fig. 88 – A graphic rendering of three different CF-graphs (A, B and C), which represent the relation between the universe and the earth solar system, based on the start of the communication cycle V (the Big Bang) respectively 16, 12 and 8 billion years ago. The positions of the observer (OP) move to the left (‘red-shift’) if the cycle V becomes longer (as the result of the ‘Big Bang’-event being further away into the past). 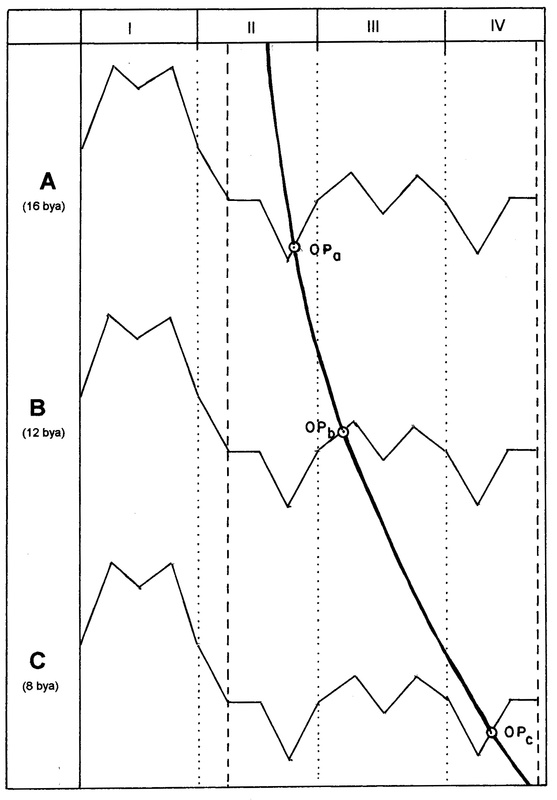 The opposite (a ‘blue-shift’) occurs when V becomes smaller and the OP advances to the right on the CF-graph (eventually moving into a new, successive communication cycle). This phenomenon was earlier encountered (p. 229) and described as a communicational spectrum shift. The graph of the shifting present in relation to the variable duration of the ‘Big Bang’ and a fixed beginning of the solar system (at 5/16V) is given in fig. 89. The X-axis gives the position on the communication graph (expressed as a value of V). The Y-axis marks the increasing length of the invisibility area (O¹ = 5 BU). The combined result is an asymptotic function. Fig. 89 – The graph of an asymptotic line, representing the shifting present (OP) in relation to the age of the origin of the universe (Big Bang) and the position (of the Observational Present) on the communication graph V.
The graph of a shifting present indicates clearly that our observational present depends greatly on the parameters, which are chosen to define that position. A place on earth, measured in the history of the universe is highly dependent on the choice of the beginning of the communication cycle. Our history depends on the choices made by the observer to define it. That choice is, on the one hand, a single and static affair with a distinct delimitation (recognized in the quadralectic approach as positions in the First of Third Quadrant). However, the choice is also, on the other hand, a dynamic event in a multitude setting, part of a communicational spectrum shift (which occurs in the Second and Fourth Quadrant). The study of the character of the spectrum shift might be as far as an observer can go in any communication. The boundless universe as the space of the ultimate consciousness will be left at this point. The return to the limited world of our personal observation holds a new knowledge in stock. Every communication has its own Big Bang, regardless of its size. The uncertainty of the very beginning and the subjectivity of the first visibility (or any other choice on the CF-graph) will always be with us. The character of the present will never be the same. This state of affairs can better be accepted then denied. The view on the asymptotic values, running away in infinity, is the best representation of our definition in place and time. We are an asymptotic man in an asymptotic time. Will this incertitude have a crippling effect on science? Can there ever be an ultimate truth? It looks as if the search for certainty took a terrible blow after the foundations of its system were questioned. The universal laws of nature have lost their unshakeable character. Is there no certainty left? Maybe this is so, but only in the (limited) conceptual environment in which the ‘laws’ were found in the first place. There is no reason to be concerned in the wider visibility of quadralectic thinking: science will get its respectable place in the communication, just like the laws of nature. Any investigation of nature can go ahead as planned. There is a truth, but its validity (and visibility) depends on the position in a division system. The observer has to face the fact that a system, a theory or philosophy that explains everything, independent of the position of the observer, does not exist. And if it would exist on a pure theoretical level – after a (four) division is decided upon – it occurs in the invisible invisibility areas of the First Quadrant and early Second Quadrant. Cognitive truth, on the other hand, is born in a multiplicity, after boundaries have been stated. The observer has the freedom to compare different frames of reference in order to enrich the observational present (OP). It is possible, for instance, to compare a CF-graph of the Universe with a communication graph of the planet Earth, as long as the (subjective) notions of beginning and first visibility are clearly affirmed. One can imagine to ‘calibrate’ various CF-graphs with the OP as a line of reference (fig. 90). This analogical procedure opens an infinite field of inquiry in all kinds of comparisons and makes the observer aware of the scale of things. Fig. 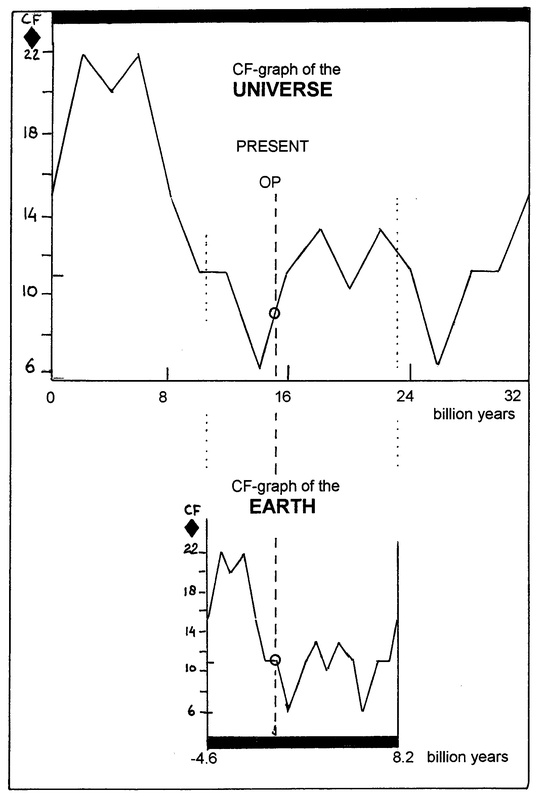 90 – The comparison between the CF-graphs of the Universe (above) and the Earth (below), with the Observational Present (OP) on earth as a line of reference. The illustration gives an impression of the scale of the history of the earth in relation to the existence of the universe. The partnership of earth and universe has some interesting details in stock if the CF-graphs are compared over a limited distance. In particular, the events around the First Visibility Crisis (FVC) are worth looking at (fig. 91). Fig. 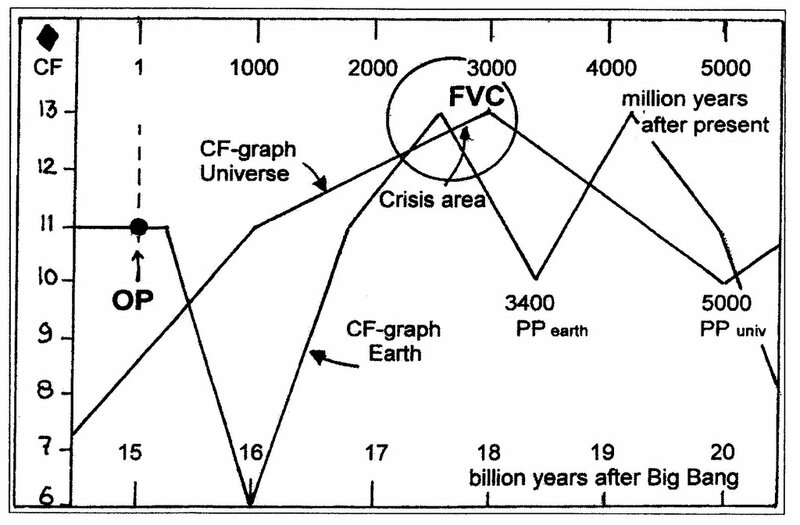 91 – The relation between the CF-graph of the universe and the earth around the First Visibility Crisis (FVC) in the Third Quadrant. The FVC is known – in the general characteristics of the CF-graph – as ‘difficult times’ (identified on a human level as an identity crisis). The earth will reach that stage in the communication over some 2.6 billion years. The Universe will arrive at this point some 400 million years later (3.0 billion years). It might be possible that the problems of the Earth are the introduction to the dramatic circumstances of the Universe-itself. Another possibility is the ‘wrong’ choice for one of the parameters, which determined the first beginning of the communication cycle and/or the first visible visibility in one of the two graphs. Some ‘calibration’ in (one of) the four parameters can make the First Visibility Crisis coincide, assuming that the Observational Present (OP) remains stable. A shift of 400 million years ‘to the right’ for the FVC (of the earth) will mean a beginning of the (earth/ LVA) communication cycle some 5307 million years ago (if OP remains static). A shift of 400 million years ‘to the left’ for the FVC of the universe would result in a Big Bang some 13 (12.9975) billion years ago (in stead of 15 billion). These exercises show unquestionably the flexibility with regards to the choices made by an observer in the present (OP) and the impact of these options in the experience of the future. A ‘double’ past (the beginning of the communication cycle and the definition of visible visibility) and a shifting present are facts, which must be considered by any observer. A new kind of science has to take the width of thinking into account.